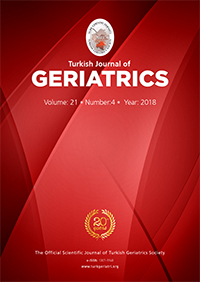 3Ankara Yildirim Beyazit University, Physiotherapy and Rehabilitation, Ankara, Turkey DOI : 10.31086/tjgeri.2018.68 Introduction: The aim of this study was to develop the Physical Activity Barriers Scale for the Elderly. Materials and Method: We developed the Physical Activity Barriers Scale for the Elderly. Fifteen elderly individuals participated in pilot testing to determine the intelligibility of the remaining 30 items after content validity assessment. After confirming the appropriateness of the scale, we administered it to 214 individuals aged >65 years (mean age: 73.9±7.7 years). We applied the scale again 3-7 days later to determine test?retest reliability using the correlation coefficient. Exploratory and confirmatory factor analysis was used to determine the factor structure. Internal consistency was determined with Cronbach"s alpha. The correlation with the International Physical Activity Questionnaire and the Nottingham Health Profile was assessed for construct validity. < Results: Exploratory factor analysis revealed three scale factors: personal, environmental factors and daily routines. Test?retest reliability and internal consistency of the scale was good (r=0.869, Cronbach"s alpha=0.918). Negative correlation was found between the Scale and International Physical Activity Questionnaire (r=?0.340, p<0.001) and a positive correlation between the Scale and Nottingham Health Profile (r=0.693, p<0.001).